As one of the most common industrial control systems, a Supervisory Control and Data Acquisition (SCADA) system is of critical importance to municipalities. By allowing for the centralized monitoring of the larger water system — wastewater treatment, storm water, water treatment, lift stations, etc. — SCADA systems streamline access and help ensure that everything is running as planned. Unfortunately, traditional SCADA systems haven’t kept pace with technology, leaving many municipalities with high maintenance expenses and a lack of flexibility, access, and security concerns. When it came time for the City of Ottawa, Illinois to address its decades old SCADA system, antiquated controls, and unreliable radio system, the municipality recognized that it was time for a broader change. While SCADA systems have historically been operated from one central, on-site computer, Ottawa didn’t want to feel tethered to or dependent on an old system. Rebuilding a SCADA system with multiple connections and hardware from various manufacturers is no small task, but engineers from Metropolitan Industries were able to work with the city to ease implementation and greatly streamline system monitoring by bringing the entire processes into the MetroCloud. From smart phones, tablets, photo storage and servers, the term “cloud” seems to be working its way into every conversation and corner of life, but what exactly does it mean to be in the cloud? Well, this mysterious storage option is actually fairly simple. When storing data in the cloud, what you’re actually doing is placing digital data on servers, often in multiple locations, owned by a hosting company. This allows you to access your information from anywhere and prevents you from having to maintain digital storage options. Additionally, transitioning the physical SCADA computer to a virtual machine running in the cloud eliminates associated IT costs, computer replacements, software update costs, and physical security concerns. Best of all, everything once requiring an operator to sit in front of a computer can be done with remote access from any Android, iOS, or Windows smart device. What this means for a SCADA system, like the one in Ottawa, is that the on-site computer server becomes a thing of the past, but the information once held on that system becomes more accessible than ever. To help ease the transition for the City of Ottawa, Metropolitan worked with the municipality to take a two-step, transitioned approach for the implementation of MetroCloud SCADA, our remotely hosted SCADA monitoring system. The first step was to rebuild the existing SCADA system and improve operator access to the data. By combining our expertise with pump systems with our deep understanding of associated software communications, we connected various components and software systems across multiple sites to enable easy communication. Though some lift stations are still on their old radio communications, other were replaced with cellular modems to allow for faster, more reliable communications and easy cloud hosting. Further, the remaining lift stations are track to be replaced in the future with our LMS II, a complete menu-configurable lift station level management system. Though we didn’t move everything to cloud storage/hosting immediately, all systems needed to communicate through the cloud. With the SCADA communications reconfigured, we were able to move to step two: transitioning a small number of municipal water components — three lift stations — to cloud hosting. The result? As planned, access was simplified, information was readily available with just a few taps, and in less than a year the City of Ottawa took the plunge. 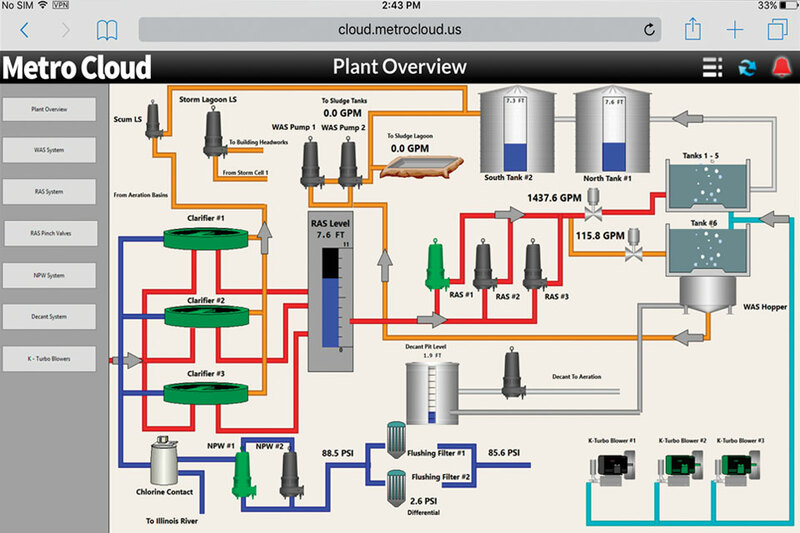 After recognizing the value of MetroCloud SCADA, they transitioned more lift stations, four wells, three pump stations, one water treatment plant, and one waste water treatment plant to the cloud and this new system has already proven itself. When the city was hit by a major tornado in February, communications via MetroCloud SCADA were sent as planned, allowing the city to remain aware of its water system despite the chaos and destruction that rocked the community. That’s all part of the security that’s inherent to every MetroCloud SCADA. When talking about the cloud, security concerns are usually one of the first things that come to mind. While it’s good to be aware of risks, MetroCloud SCADA puts security first by working to guarantee uptime and restrict access to information. To ensure reliability, all data using the MetroCloud platform is hosted on Amazon Cloud Servers, with 99.9% uptime and multiple servers in geographically redundant zones, meaning you’ve always got a backup should something go wrong. Additionally, we designed this system so that it’s not exposed to the Internet. A private Internet protocol (IP) address essentially creates a gated community for your information, limiting access to sensitive municipal data, and when connecting to MetroCloud via Ethernet connection, VPN tunnels encrypt all data. Finally, the system partners with cellular carriers to create a private network connection between MetroCloud and the cellular network. With all of this being done by Metropolitan’s experienced pump system and control experts, setup is quick and ongoing maintenance is minimal. In addition to the cloud offering easy access, this storage/communication option eliminates the need for dedicated on-site computers/servers and the costs associated with maintaining this added infrastructure, including SCADA software licenses and upgrades. In fact, with free upgrades automatically pushed to the system, there is no IT involvement at all for most applications. You could say that we have our heads in the cloud, and we’d probably agree. By remaining at the forefront of innovation in the market with MetroCloud, we’re taking steps to ensure that our clients are ready for the years ahead. Backed by a 60 year history of proven expertise in the pump systems industry, we’re looking forward to the next 60 years and we know that phone lines, computer towers, and at-risk data won’t get us there. Ready to Upgrade Your Pump System Monitoring? 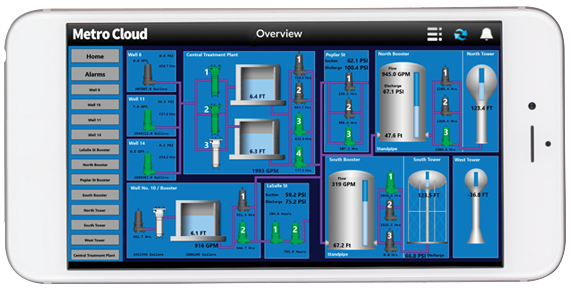 Learn how Cloud SCADA technology can enhance your pump monitoring capabilities.